I, like many, have been intrigued with the Carly Fiorina candidacy for President of the United States. Many of us have eagerly waited to see if she was more than a CEO with controversial reviews. In the first debate she was clear, cogent, and compelling. In the second debate this last week she was even more so, with a powerful composure, an admirable knowledge of the world, and an iron will, not unlike our “Iron Lady,” Margaret Thatcher, in England. Ms. Fiorina has separated herself from other female candidates over the years, aided by Mr. Trump’s inappropriate comment, by making her presidential bid about merit not gender. Women sighed with relief nationwide. Did you hear it? That universal sigh? At last, we thought, someone who understands. But what I hadn’t focused on, and probably why as a writer I have come to especially value her candidacy, is Ms. Fiorina’s use of language. She is a poet with an intuitive sense of the power of words, images, and symbols. She understands America’s need for the right phrases at the right times to draw our nation together, to heal our divisions. I think what this nation can be and must be can be symbolized by Lady Liberty and Lady Justice. Lady Liberty stands tall and strong. She is clear eyed and resolute. She doesn’t shield her eyes from the realities of the world, but she faces outward into the world nevertheless as we always must, and she holds her torch high. Because she knows she is a beacon of hope in a very troubled world. And Lady Justice. Lady Justice holds a sword by her side because she is a fighter, a warrior for the values and the principles that have made this nation great. She holds a scale in her other hand, and with that scale she says all of us are equal in the eyes of God. And so all of us must be equal in the eyes of the government, powerful and powerless alike. And she wears a blindfold. And with that blindfold she is saying to us us that it must be true, it can be true, that in this country in this century it doesn’t matter who you are, it doesn’t matter what you look like, it doesn’t matter how you start, and it doesn’t matter your circumstances. Here in this nation, every American’s life must be filled with the possibilities that come from their God-given gifts, one nation, under God, indivisible, with liberty and justice for all. Such patriotism is scoffed by liberal academic elites. But after years of these elites governing, years of dangerous sophistication and overweening arrogance, years of enforced political correctness, Americans are disheartened and angry enough to look to someone brave and true. We bolt our doors and fear the dark. Our streets are not safe. Our police are attacked and prevented from enforcing the law, in communities where the law needs enforcing. And we wonder when terrorists, abroad or at home, will next attack. And to this day, we welcome legal immigrants to our shores, as long as they welcome us, as long as they embrace freedom and liberty, justice for all, speak our language, as long as they want to be Americans, unhyphenated, undivided. 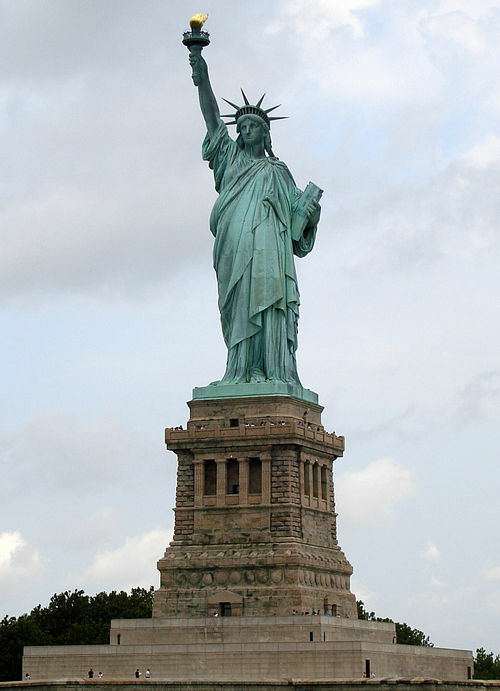 The Statue of Liberty, made of copper, was designed by Frederic Auguste Bartholdi, built by Gustave Eiffel, and given to the U.S. by France. Somehow, I would venture to say, our “Eiffel tower” is more powerful (and beautiful) than Paris’s Eiffel Tower. Representing the Roman goddess of liberty, Lady Liberty holds a torch that lights the path to freedom and a tablet of law inscribed with the date of American Independence, July 4, 1776. A prisoner’s broken chain lies at her feet (Wikipedia). And so is Ms. Fiorina. The tablet that Lady Liberty holds is the law of Lady Justice, blind justice, equal-under-the-law justice. Many Americans have forgotten what that means, as it grows more rare with each day. Many Americans feel they have been exiled from their own country or one day will be. And so I thank you, Ms. Fiorina, for reminding us of these two great ladies, Liberty and Justice, and for giving us renewed hope in America. I pray that you inform the substance and standards of future presidential debates and that having raised the bar, others must reach higher. I pray that those who belittle excellence, who crave clamor over conversation, that they take note that this is how we want debates to be, this is how we want our leaders to sound, this is how we want to be represented to one another and to the world. For we Americans have become those masses who are so very tired and poor and huddling and yearning to breathe free. We are exiled, and we want to call America our home once again. This entry was posted in Uncategorized and tagged Americans, candidate, excellence, exiles, fiorina, freedom, image, Lady Justice, Lady Liberty, metaphor, migrants, presidential debate, second debate, symbol, West, writing. Bookmark the permalink.